You are here: Home » Happy Birthday T! It was the ? ?th birthday of one half of my dynamic cooking buddies, T & J. This month – it was T’s birthday – but I have J’s ? ?th birthday coming up in a mere two months! That’s two whole months to sketch out a cake! I suppose it’s become a bit of a tradition of mine to present my friend with a custom birthday cake for the occasion. I think in the years between school and family – we tend to overlook the tradition of presenting an actual cake! 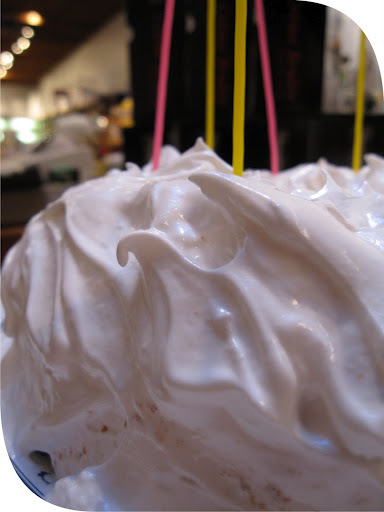 It sort of disintegrates into a birthday dessert at a restaurant or, *gasp* a birthday drink. Not that I am opposed to a birthday drink – but hey! I want to slice a cake! I had two cake presentations this week – the H-izzo’s birthday was earlier this week, so I had to schedule my week strategically so I could get both of them done. 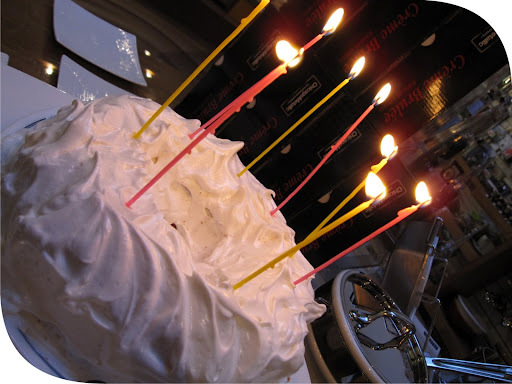 I didn’t bring my camera to H-izzo’s house, so I’ll publish T’s cake this post. 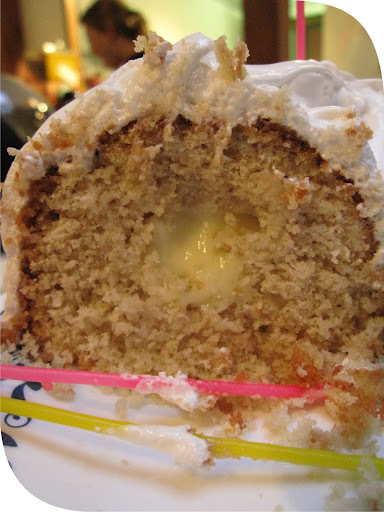 It was an unintentionally dense coconut cake baked in a round cake mold, ‘filled’ with sweet lemon curd and topped with seven minute frosting. Yes, it was quite an undertaking. I had no idea coconut cakes were so….rich! All the recipes I looked at contained a sinful amount of butter and eggs, so I opted for a buttermilk-style cake and added coconut and coconut milk (instead of buttermilk). It was baked in a round, Bundt-style cake mold and then I carved out a ring on the top, scooped out some cake, doused the whole thing in a Malibu-syrup, filled it with lemon, replaced the top cake ring and then frosted that mo-fo. ← Banana Bread…or is it Cake?